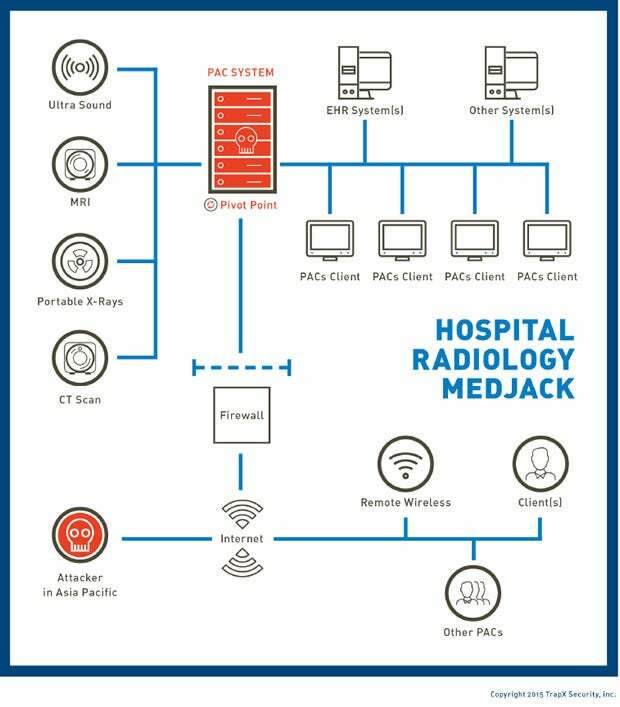 Attackers are infecting medical devices with malware and then moving laterally through hospital networks to steal confidential data, according to TrapX’s MEDJACK report. After the Office of Personnel Management breach, medical data was labeled as the “holy grail” for cybercriminals intent on espionage. “Medical information can be worth 10 times as much as a credit card number,” reported Reuters. And now to steal such information, hospital networks are getting pwned by malware-infected medical devices. During a different persistent attack at another hospital, the attacker moved laterally through the networks looking for other targets. But the “source of this lateral movement was the picture archive and communications systems (PACS) that provided the radiology department with the storage and access to images derived from multiple sources. These image sources included CT scanners, MRI scanners, portable x-ray machines (c-arms), X-ray and ultrasound equipment.” The PACS system also tried to act as a botnet and connect to Command and Control. The lateral movement “appears to have enabled the infection of a key nurse’s workstation” and confidential hospital data was being exfiltrated to Guiyang, China. It’s believed to have all started after an end-user in the hospital surfed to a malicious website. We’ve heard about potentially lethal attacks on medical devices like insulin pumps and pacemakers, which got the feds pressed into protecting wireless medical devices from hackers; a couple years later, DHS started investigating 24 potentially deadly cyber flaws in medical devices. Now there's more bad news on the medical device scene as vulnerabilities in drug infusion pumps could be remotely exploited by an attacker who could up the dose into a fatal dose.